Detour's stopped working for me. The channel's silent. Very keen on No Moon At All. What version of "This is the Army Mr.Jones" is this, I cant seem to find it and its quality is incredible! From a 75 yr. old wanderer, thank you thank you! I'm really glad you are enjoying the radio station. I do love big bands. As for the craftable radio. It already comes with a craftable radio for settlements. It's actually the default photo for the mod. I took the pic in game after building it and placing it on the counter at Red Rocket. I believe it is in the Decoration/Misc category. Having mods that change the workshop menus may move it someplace else or it may not show up at all. I use a complete vanilla version of FO4 for mod testing so I have no mods installed other than mine for PC testing. However, I do use the XBONE version of the station and it works fine with over 10 plus settlement object mods installed. As for the .esl format. I actually didn't know what that was so after a quick google I get it. So thank you. I will look into getting that done. Yes, Im an idiot as usual, I did find it and made a few. I've got so many I guess I missed it the first time looking through my Misc. Sorry about that. l am really impressed with your commentary on some of the songs on your description page. BTW, late great singer Eva Cassidy did a wonderful rendition of the song Autumn Leaves on your list. It's a fun side project making the track list. I do however need to finish it. I'll try and add more tonight. Been busy with my interior mod. Just listened to Eva's version of Autumn Leaves. You were right. It was fantastic! Yes! The NMM download is working now! I know a lot of folks were reluctant to try this mod as a manual download... well be reluctant no more! 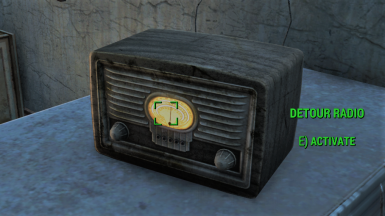 This is the most lore-friendly Fallout radio mod I've yet tried and I LOVE it! Happily endorsed and I considered it to be a 'Must Have' mod. Thank's for the heads up on the NMM download working WilliVonBill. I'd take credit for fixing it but I did absolutely nothing. Thank you Nexus for whatever you did. Let you know that can not download from new nexus web, had to use old nexus Manual Download (Visit old website). This is the best radio mod I've used! Works like a charm, and fits with the diamond city radio atmosphere.So many songs, this deserves so many more downloads! Thank you. I'm very happy that you are enjoying the station.